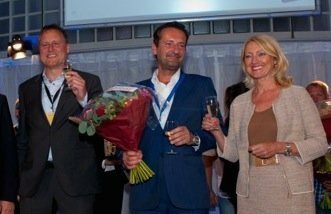 Amsterdam: Last week saw Dutch firm, Micanti, win a prestigious award for its non-toxic antifouling. Micanti has designed a 100% environmentally friendly antifouling foil. Its working is based on small fibers, which make it very unattractive for organisms to attach to the hull of a ship. For this innovation, Micanti was awarded an SME Innovation Top 100 accolade from the Chamber of Commerce. The SME Innovation Top 100 is the biggest and most prestigious innovation award of The Netherlands. The so-called Thorn-D foil was developed by Dr Ir Rik Breur. The millions of tiny fibers or hairs on the foil are resilient and vibrate constantly by the water movement. This combination of prickliness and swaying of the fibers makes the surface unattractive for organisms to settle. The nylon fibers are similar to the spiky hairs that organisms have to combat fouling.